The greatest television shows according to me. 'Superstore', this is by far the most recent thing I've written about for this article that after a long national panic and concern is finally back. I know everybody was really, something about it, and boy that something is back here to talk about one of the best new television shows in a long time. Except for all the really good new television shows that came out relatively close to when those came out, but it's still quite good. 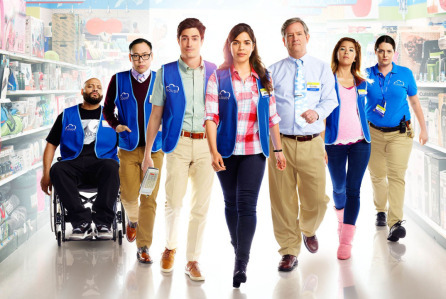 'Superstore' is a show that takes place essentially in a non-Walmart Walmart called Cloud 9, and it follows, that is, it centers around Amy, played by America Ferrara, Jonah, played by Ben Feldman, Glenn, played by Mark McKinney, and Garrett played by Griffin Dunn, Cheyenne, played by Nichole Bloom, and Dina played by Lauren Ash (who is my mom's all time fav by the by), and Mateo played by Nico Santos; and their various wacky mishaps with other people. This show started off, essentially, as that old cliché of having everything against it, and everybody thought it would fail, but it hung on and it truly survived, and it's fantastic, man. I don't know how it survived. When it first came up they released five episodes at once, which is a classic sign that the network has zero confidence in a project. I remember distinctly, clearly when I was talking about it, saying, it's a funny show, but there's no way in hell that this thing's going to last. But it did, it did, and it grew and it grew, and it grew and grew until it became one of the better shows on television at this moment. It achieved the highest honor a television show can achieve, which is to be reviewed by me. For this column, why is it so good? Well let's talk about the plot. Let's not talk about the plot. I don't want to talk about the plot yet because I'm going to talk about the visuals. about visual comedy. Well, the creators of this probably didn't realize it, but they're following a lot of principles of visual comedy. So I'm going to paraphrase, and I'm not supposed to, but paraphrase what Tony was talking about a little bit. Why 'Superstore' works so well as a TV comedy is that it is an individual experiment. A lot of comedies are I would say dialogue based, which is fine. But also you know you could easily not show the visuals in comedies and that would probably work just as well. You could do that for some of the scenes in 'Superstore' but a lot of other scenes, especially the transitions, which are some of the funniest parts, rely totally on visual humor, and each one of them is uniquely funny and strange in its own way. They seemingly do not ever run out, like the latest episode. I just saw had a pretty funny one where somebody bowled a bowling ball and hit one of the soda displays. That's pretty funny, and that's the latest episode, and they're showing off their crap, which is amazing. The plots are both standard and un-standard. I've never gotten into yelling at the screen of the television show, saying just kiss already, kiss already, why aren't you kissing? With Jonah and Amy this is not like their relationship, that story line is particularly like new. I mean from day one they're the two younger attractive people, most attractive people in the cast. Of course, they're the ones that are going to end up together, but I think it's just because both actors are really charming and Jonah and Amy have really great chemistry as characters. They seem to be good friends on top of just everything else, which makes it work for me. One of the more original story lines, and I like how they handle this because I feel some shows do it one episode then forget about it, which is not a favorite technique of mine when dealing with political issues, is the Mateo-Jeff story line, where Mateo ... Oh watch that. Played by Nick Santos, the kind of vaguely, slightly prickly cast member of Filipino origin discovers he was, in the political terminology today, a dreamer. Or a child that immigrated illegally but lives in America his entire life and wouldn't know what to do if he was not in America. Initially he has to work hard to never get a background check, and that means having to break up with his boyfriend, district manager Jeff. They had to break up because Jeff couldn't date an employee, and all Mateo would have had to do was transfer to a store that Jeff didn't manage. But that would require a background check and that is all the kit and caboodle. In this latest episode Jeff quits his job to be with Mateo, and I love that man, this is romantic as hell. It's good. I like all the characters a lot. My favorite character is the creepy pharmacist. I laugh every time I watch that, that's just great. Now we talked about the characters and the story lines but lets go and do it. Man, lets get deep into the thing and talk about almost everything there is to talk about with 'Superstore'. I didn't even bring up Mark McKinney, who's Glen. Now I get a sense that in the early reviews Mark McKinney was probably the most mixed performance that they reviewed. I love Mark McKinney, I love 'Kids in the Hall'. I have an extremely, extremely tenuous connection with some of those people that were there. So I guess whatever, and I kind of get it, but then I think everybody got over it pretty quickly. Man his performance has grown from like real good to great. It's the weird frog voice he does with Glen, which is odd but in the end really works to him to go off as kind of a weirdo and a loser, but a lovable weirdo loser manager dude who's super religious. That's his life and that's all there. I did not even mention the odd zen master that is Garrett (that is another whole article). The mark of a good comedy generally is, to me at least, well written characters. If the characters are well written it means the show is well written, and if the show's well written that generally means there's some humor to it, because humor is a human part of society and good comedy needs all three of those. But really the good mark of a television show is that the characters can just sit around with no plot and talk, and that can be compelling in and of itself. 'Superstore' has that in spades. The plots are also very tightly scripted so I think it's a very good show. You might have got that hint from the title that I like it, and that I may or may not be doing a longer look at it at some point in the future. So 'Superstore', watch it, because it's on now. Mar 22 Shall no one mourn the death of Seeso?